Much livelier than the first film, this one jumps right into things and goes big in every way. 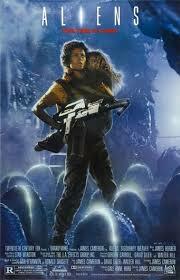 Aliens are the rare sequels that are better than the original film. it’s the movie that takes the world of alien, which was created by riley Scott, and takes whatever that movie had going for it, and spices it up. it’s one of those situations where a new director, James Cameron, saw alien and realized just how much more he could do with it. instead of one alien, let’s have a bunch. instead of a crew of helpless astronauts, let’s have the characters be a group of marines. The movie is smart enough to not only start off right where the original film left off, but to also resort back to that original film and retell the events of what happened in it. This is a continuation of the story, and in fact, fleshes out more about the alien universe and the way these creatures are born. In the first movie, we saw the egg, the creature that jumped out of the egg, and way it attached itself to a guy’s face, and the way it impregnated him before bursting through his chest. This time, we get to see how the eggs get dropped to begin with, and we meet the queen. But long before that, we are hearing Ripley (Sigourney Weaver) talk to a board that represents the company, and tell them about what happened to her crew. She destroyed an expensive piece of company hardware (the ship) and they want answers for it. By the end of the conversation, they have revealed to her that there has been a colony on this distant planet, LB426, for twenty years now. The people of the colony have setup camp on the planet and have been given the mission of using a machine to oxidize the air and make it breathable for humans. Not long after this, Ripley gets a visit by Burke (Paul Reiser), the company man who acts as a liaison between her and the powerful authority figures with money. He tells her that they lost contact with the colony and want her to accompany them on a rescue mission. Considering that she still wakes up every night with sweating nightmares about an alien bursting out of her chest, she doesn’t even consider the idea. But then one night she does, calling burke up in the middle of the night to ask him only one question. “Tell me you’re not going out there to study or to bring back. You’re going out there to destroy.” he promises her that, and just like that she’s on board. the movie now takes its time getting to the aliens and that’s a good think. movies of today rush to the monsters / big effects, as if audiences can’t handle waiting a little. we’ve all become add. and desensitized to big screen excitement because it has been given to us in overkill. I blame Michael Bay and those just like him. but Aliens was made at a much smarter time, when setup was just as important as follow-through. 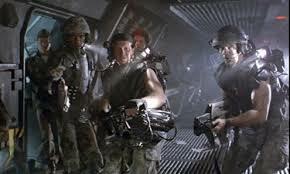 Ripley, Burke, and a group of marines travel to the planet and Ripley gets to stand up in front of the marines and tell them about what happened to her in the first movie. I love sequels that embrace the first film and continue on with the same story and this movie does that perfectly. we even see pictures of the crewmembers from that movie at the start of this one. This movie is also smart enough to use foreshadowing in order to get Ripley into a huge cargo loader machine and show us that she knows how to operate it. This way when the machine comes back at the end, we believe that she could really use it against an alien. it is just one of many details that is carefully worked out and developed here. Another one is Ripley’s learning to use the machine guns of the marines, at about three quarters into the movie. another film would just have her pick up the gun and start using it, and have the audience suspicious of the believability. This one spends the time to have her taught by Hicks (Michael Biehn) and ask questions about the weapon and everything. After about an hour of the movie, the marines find themselves in a room full of cocoon-like wall wrappings, with dead humans packed inside of them. The human bodies have been preserved in order to harvest aliens, like incubators, and as soon as the marines open fire on one of these baby aliens bursting out of a dead human’s chest, the adult aliens start moving off of the walls. now the action has begun and it is exciting as hell! From this point on, the movie goes full throttle. Yes, there are breaks from the action and time to recoup and examine possibilities, but once the alien’s start coming, they never really stop. these creatures are not only deadly and ferocious, but they are also smart. There are a couple of scenes where the marines have the aliens on their tracker and know that they are nearby, but don’t see them and can’t pinpoint exactly where the creatures are. that idea, which came from the first movie, where Dallas (Tom Skeritt) went hunting the alien down the corridors with his radio team telling him how close he us, is another idea that is taken to the next level, here in the sequel. This time, it’s the aliens hidden on the walls, or on the roof above them, when they think the creatures might be right outside the room. This movie really has it all. it has cool machinery, technology, and effects, curiously of James Cameron, the ultimate pioneer in cinematic sci-fi. I was thinking about how everything in this movie was really built, whereas in films today all of the big machinery is just computer drawings. and I was thinking about when the change took place and we started going over from actual robots to computer effects. The movie that really started the cross-over was Terminator 2 (also Stan Winston on the effects, like in this movie, and also James Cameron as the director.) Terminator 2 had the liquid metal guy forming out of the floor, and ever since that movie there has been no looking back. Aliens and Terminator 2 will always be his two masterpieces. both films are better than the original movies. both bring us into a world of believable sci-fi that pays attention to details and real possibilities. Both are also amazing action films, carefully constructed with both effects and emotion. 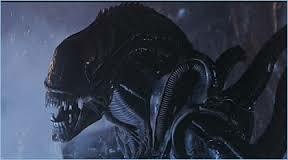 Aliens in particular gets all of it’s beats just right, including perfect pacing and really cool music / sound effects. whether it’s the clanging metal sounds or the heart beat-like tracker that the marines use to see where the aliens are, when they know they are nearby, this movie masters everything, including sound. It’s all meant to create an experience and an edge of your seat feeling of suspense, and it works. The climax of this movie with the queen is a classic moment of cinematic history. especially when the garage-like door opens and Sigourney Weaver is standing there in the giant robot cargo-loader machine. The movie has brilliant effects and technology, but it also has the human side in full force with its wonderful casting (Lance Hendrickson as the emotionless robot, bill Paxton whining and freaking out like nobody else.) Aliens is a movie that should be studied and analyzed to no end. It not only expands and improves on the first movie, it takes the sci-fi genre as a whole to new and innovative levels.